DNA coaxed out of a 12,000-year-old fossil from Argentina is providing unique insight into one of the strangest Ice Age giants: a tank-like mammal the size of a small car with a bulbous bony shell and a spiky, club-shaped tail. Scientists said on Monday their genetic research confirmed that the creature, named Doedicurus, was part of an extinct lineage of gigantic armadillos. Doedicurus was a plant-eater that weighed about a ton and roamed the pampas and savannas of South America, vanishing about 10,000 years ago along with many other large Ice Age animals. "With a length of more than three meters (10 feet) from head to tail, it certainly looks like a small car, like a Mini or Fiat 500," evolutionary biologist Frederic Delsuc of France's Université de Montpellier, one of the researchers, said. It was a member of a group called glyptodonts that shared the landscape with giant ground sloths, sabre-toothed cats and towering, flightless, carnivorous "terror birds." Some glyptodonts made it as far north as southern portions of the United States, from what is now Arizona through the Carolinas. 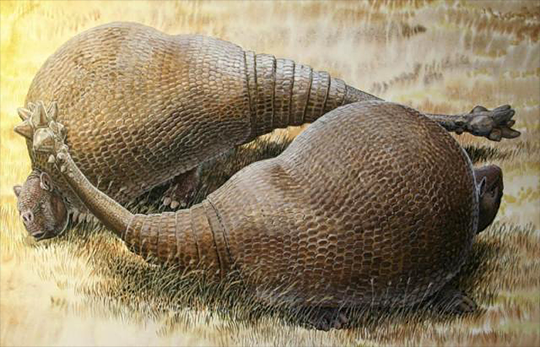 The researchers were able to place Doedicurus and the other glyptodonts into the armadillo family tree after studying small fragments of DNA extracted from bits of the creature's carapace. They used a sophisticated technique to fish mitochondrial DNA out from a soup of environmental contaminants that had leached into the fossil over the eons. They determined the glyptodont lineage originated about 35 million years ago. The oldest armadillo fossil, from Brazil, was around 58 million years old. Asked what someone might think upon encountering Doedicurus, another of the researchers, evolutionary biologist Hendrik Poinar of McMaster University in Canada said, "That's the biggest armadillo-looking creature I've ever seen, and it has a tail like an Ankylosaurus. Yikes!" Doedicurus resembles the dinosaur Ankylosaurus, which also was heavily armored and wielded a club-like tail. The researchers said the resemblance was an example of "convergent evolution" in which disparate organisms independently evolve similar features to adapt to similar environments or ecological niches. Scientists have debated whether humans contributed to the extinction of the glyptodonts. Poinar said he believed that humans played a role, saying most of the large mammals of that time were under pressure not only from climate change as Ice Age waned but also from human hunting.